This Best Western hotel in Ketchum, Idaho offers cozy accommodations and deluxe amenities for travelers coming to the Sun Valley area. Situated in the middle of Ketchum, Idaho, the Best Western Kentwood Lodge provides guests with convenient access to Sun Valley as well as skiing at Mount Baldy. Guests have the choice of a standard well-appointed guest room with a mountain view, a deluxe room with balcony and spa or an oversized kitchenette suite. All rooms include a microwave, refrigerator and high-speed Internet access. Guests can dine at the coffee shop or cafe, both located on the hotel premises. Other hotel amenities include an indoor pool, spa, fitness facility, game room, ski lockers and meeting space to accommodate up to 65 people. The Best Western Kentwood Lodge is located a few miles from a wide variety of outdoor activities such as hiking, biking, horseback riding, boating, rock climbing and fishing as well as skiing. The world-famous Sun Valley Resort is just a short drive away. Guests can also take day trips from the hotel to visit Mt. Borah, the highest peak in Idaho or the Craters of the Moon National Monument. The Ski and Heritage Museum and the Ernest Hemingway Memorial are also close by. While in town, guests should take advantage of the numerous festivals and fairs held year round such as the Silver's Antique Car Show, the Sun Valley Wine Auction and the Sun Valley Swing N' Dixie Jazz Jamboree. 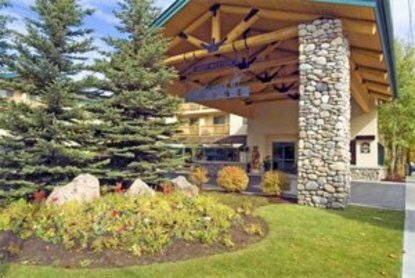 The Best Western Kentwood Lodge offers the ambiance that one would expect in Sun Valley, along with impressive amenities that will make your stay pleasant. Kentwood Lodge.